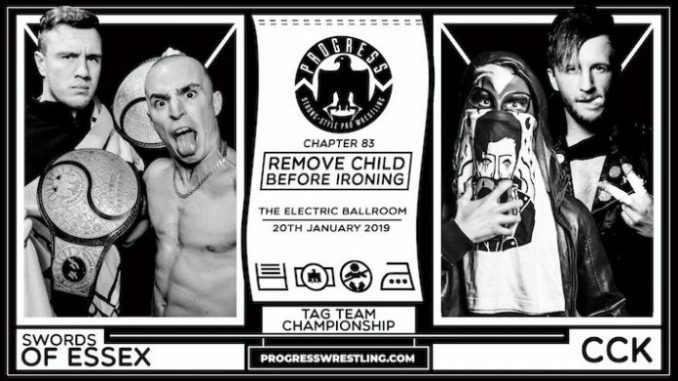 Progress Wrestling Chapter 83 "Remove Child Before Ironing"
Progress Wrestling Chapter 83 took place Sunday from the Electric Ballroom headlined by the Swords of Essex taking on CCK for the tag titles. A very good opener, heavy on hard-hitting offense, light on selling. A few shaky moments in this match which prevented it from really gathering any steam, hopefully not the last we’ll see of these two as they are both capable of much better. The best match of the night, in my opinion, Irie has made a lot of fans during his stay in the UK, and Ridgeway’s reputation is steadily growing. Ridgeway asked for a shot at Progress Champion WALTER after the match. This was a great match until Ospreay clotheslined Lykos over the top rope, and it was clear there was a problem. The remaining three men finished the match but the attention of the audience was on Lykos receiving medical attention on the outside. Kid Lykos had terrible luck with injuries in 2018 and it seems he’s been struck down again. The Swords of Essex cut a heel promo mocking Lykos to end the show. Progress Wrestling posted an update after the show regarding the injury sustained by Kid Lykos.